North West England: Artists and Subjects, Continental European after 1800, Continental European before 1800 15 comments Can you find another version of 'Cattle, Horseman, River and a Ruined Castle'? This looks to be a composition in the manner of Aelbert Cuyp but I have been unable to find any other version of it. Maybe Art Detective can help? Yes, it is in the manner of Cuyp or someone like Nicolaes Berchem. Another contender is Jacob van Strij (aka Stry) (1756 - 1815), "a skilful and deliberate imitator of Cuyp" (Daily Telegraph, January 1903). See the attached composite for comparison with this painting and three other of his know works. Above - know should read known......apologies to one and all. Kieran, I had never heard of van Strij, but the Bolton picture could easily be by him based on comparison with the known Strij at top right in your composite. It has the exact same "naive" quality and style (he was not accomplished enough to be taken for Cuyp, though the imitation is clear enough). The cattle in both pictures are almost identical, as are the "ruins." It's really a very good fit. Thank you Jacinto. An analysis of the canvas and the paint might show that it is more likely to be late-18th/early-19th century effort, as opposed to a 17th century work by the likes of Cuyp. Van Strij/Stry appears in many newspaper accounts of painting sales during the mid-1800s. One in particular mentions a painting of ruins, cattle and figures, so he was definitely executing works like the one featured in this discussion. I'll find the reference again and post it for consideration. The Bolton picture is described as being painted on 'board', a rather imprecise term. It would be helpful to have from the collection confirmation that this means a wood panel. Van Strij used both canvas and wood supports. I suppose van Strij could be considered a poor man's Cuyp, as his work is certainly more primitive or rudimentary and rather stiff. In any case, he is a very strong contender as the painter of the Bolton picture. 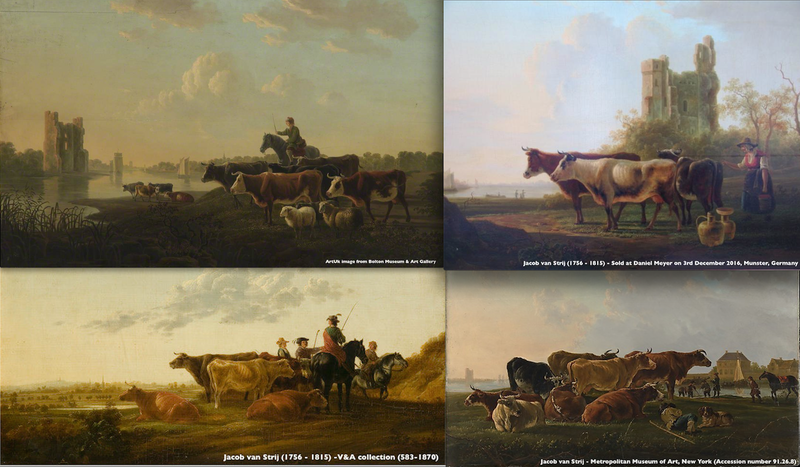 A search of ArtNet.com, under Jacob van Stry, will reveal over 300 examples of work, many of which are like this one with its cattle etc., and quite a few feature the same castle from various angles and distances. Also, the artist depicts the two-sailed boats, which can been seen in the background of this picture, in an identical way. Many of his paintings are also described as 'oil on panel'. The match between this picture and known work by van Strij is practically perfect and highly convincing. I think the question is not so much proving that he was the painter but proving that he was not. Another compelling fact for the suggestion that this painting is by van Strij/Stry is that the ruin depicted is Huis Te Merwede Castle, which is located in the north-eastern part of the city of Dordrecht, in the province of South Holland in the Netherlands. Van Strij was born in Dordrecht (now Dort) in 1756 and died there in 1815. A Google images search for "van Strij" + "Merwede" reveals several other depictions of the castle from different perspectives. See also http://www.castles.nl/merwede-castle for a variety of images of the castle, which was also painted by Cuyp. Because of the link with Jacob van Strij, this discussion is now linked to the Continental European before 1800 and Continental European after 1800 groups. Has this discussion concluded? Are there any alternatives to the Jacob van Strij suggestion? I went to the Witt Library the other day to look at comparisons. The composition is certainly much closer to van Strij than Cuyp, for example. It is hard to gauge the quality of the Bolton picture, but I don't think van Strij was that great an artist so it would be safe to call it 'Attributed to Jacob van Strij'. this landscape also shows the unfinished tower of the Great Church of Dordrecht in the far distance (like the Bolton picture, but seen from another side without the ruin in the foreground). However, his certain works are also a bit different from the Bolton picture. I have a list of over 15 other painters working in Dordrecht at the time. I haven't yet figured their seperate oeuvres out. I do know other examples of the same artist. As soon as I find out more, I will let it know. Sander, thank you very much for your extremely helpful comments on this painting and on the work of Van Strij. We look forward to hearing more.